At Cambridge City Council’s South Area Committee on the 11th of November 2010 I asked the police about the arrangements for enforcing the traffic regulation banning through traffic from using a stretch of the new Addenbrookes’ Access Road. I noted that in April 2009, in response to my question, police Sgt. Morgenthaler had stated that the system would be entirely automated and would therefore not use up any police time at all. I asked if this was still the case, and drew attention to a email sent by Long Road Sixth Form College which had stated there was no automated enforcement and cameras would be used to identify vehicles worthy of investigation. Prior to the road opening it had been reported that those taking less than fifteen minutes to proceeded through the Addenbrookes’ site via the road would be in breach of the law. I asked for confirmation of what the current enforcement criteria actually were. Is there a whitelist in operation; of vehicles permitted to use the road? Are all emergency vehicles, especially ambulances, able to use the road freely, without their drivers having to get involved in paperwork? How long is the data collected by the cameras kept; is it only being used for enforcement of the traffic regulation, or is it available for other uses too – such as investigating other crimes? If more police time is to be spent on this, will it be taking officers away from policing Addenbrookes’ and South Cambridge? Who will be involved in the enforcement, will it be police officers or police staff? Police Sergent Gavin Townsend responded. He spent a couple of minutes explaining the current position. He said the road had been open for three weeks, and that there were ANPR cameras at either end of the road. He said his understanding was that employees, workers, (he listed them both!) and ambulances were permitted to use the road. The committee were told the cameras were owned and operated by APCOA the private company contracted to run the Addenbrooke’s car parks. The police are going to monitor the situation for three months. Sergent Townsend said he wasn’t able to actually answer my other questions. This prompted groans from the public seating. He committed to respond directly to me and I gave him my email address. Mr Davis said he was unsure of the detailed arrangements, but said letters would go out to those who would be permitted to use the road explaining them soon. Mr Davis confirmed the cameras were not owned and operated by the county council; but were, as the police had said, owned by the private parking contractor APCOA. I think the lack of clarity here is astonishing. Neither the police or the county council appear able to clearly explain what the law is and how it is being enforced. The latest “information” (which may or may not be accurate) comes from an article posted on the 16th of November by County Councillor Harrison, she writes about the possibility of: “a penalty ticket from the hospital authorities” and states: “drivers using [the road] to drive right through the Addenbrookes site may get a fine from the hospital authorities unless they have permission to do so.”. Cllr Harrison does not explain on what basis the “hospital authorities” would be issuing “fines” to people due to the way they have used the public highway. The road itself is not a private road, and the cameras are on the public highway – you can drive past the cameras without going through the “access only” signs. Cllr Harrison has stated those entering and leaving by the same point will avoid trouble, a point not made in the information published by on the County Council’s website. Novel Traffic Control Experiment Proposed at Addenbrookes – my article from April 2009. County Council webpage on the Access Restrictions – this does not make clear if a Traffic Regulation order is yet in force, or make any mention of the police role in enforcement. Addenbrookes Access Road – be careful – Article by Cllr Nichola Harrison, November 16th 2010. This entry was tagged Addenbrooke's, Transport on November 17, 2010 by Richard Taylor. So is there a Traffic Regulation Order on Francis Crick Avenue? ; is Francis Crick Ave a de facto private road? The restrictions appear simple “no motor vehs except for access” but because “access” is hard to define, it becomes a complicated situation. At least we don’t have entry and exit barriers to the site which would be the next logical step; I do hope that doesn’t happen. I get the impression that the roads covered are not currently highways, which is why there’s still private parking enforcement going on. Violating the TRO is a criminal offence (assuming the signs are adequate), and so would usually be dealt with by the police. It’s possible that the hospital owners are planning to claim that it’s also either civil trespass (for which they can claim damages) or some kind of contractual service (for which they can charge a fee). The latter would fit with the way parking is usually handled, but I wonder if such a contract might be void for illegality. Perhaps the TRO takes precedence, but the wording on the sign “except for access to hospitals” seems very woolly to me. Which hospitals? Thanks for providing a link to the TRO Ben. It’s astonishing the council don’t proactively publish these things online. A key question is if Long Road Sixth Form college counts as a property adjacent to the campus perimeter road – I think it clearly is – and so access to the college via Addenbrooke’s road is permitted by the TRO. There is nothing in the TRO exempting those entering and leaving the restricted roads via the same point either. As the cameras are on unrestricted roads it appears the intent is selective enforcement. I think selectively enforced laws are terrible as they give huge power to those doing the enforcing. Clearly the signage is at best inadequate; it suggests there are more restrictions than there in-fact are. With respect to ambulances, and other exempt vehicles (eg. Cllr Harrison has pointed out those providing a voluntary hospital car service) the question isn’t if they are exempt and if they would be able to defend a charge in-front of magistrates, but if automatic systems are in-place to prevent these drivers being threatened with action and having to defend themselves. Richard, as usual, has done a good job detailing the complete incompetence of the people who run Cambridge, this time with regard to the rules about access to this link road. Yet the underlying issue is being completely ignored. Why was the road designed as an access-only road in the first place? (Yes, we know the answer to that one, namely that the Cambridge, and UK, ruling elite hate drivers, excepting themselves. And the world would end if we did anything positive for drivers.) Who was responsible for that decision and will they take responsibility for the resulting stupidities that Richard has chronicled? It’s the same kind of idiotic transport planning which means that car parking on the Addenbrooke’s site is inadequate and expensive, resulting in horrible over-spill onto neighbouring streets. When I visited the link road on a Saturday afternoon you could have played football on it, there was so little traffic. Although so-called environmentalists get hysterical when a road is built and then (shock horror) people actually use it (how dare they), it is far worse when a road is built and hardly used. OK, maybe it will finally be used to some reasonable amount when the Clay Farm site is developed, but meanwhile motorists could rightly view this as just another example of the Cambridge ruling elite sticking two fingers up to them. Of course the road is now so badly designed that it would take yet more money to actually make it an adequate through road, but this is what happens when your number one transport planning goal is to screw motorists. I find this all incredibly depressing. The TRO is relatively straightforward (after a number of false starts) but there has been a great deal of confusion mostly caused by no-one leading. I would’ve thought that Roy Pegram would spend some of his ‘Special Responsibility’ on making sure that it was set up properly and that everyone understood what they had to do but, despite several promptings, he has let it drift with on hand on the tiller. I’ve made some suggestions to the County Council for improving their web page on the access restrictions. I’ve asked the hospital what their procedures are for enforcement here. Oh don’t be ridiculous, a Saturday afternoon is not a fair representation of usage. If it is empty at 8.45 on a Tuesday morning you MIGHT have a point. From colleagues I have heard that the access road has made a massive difference in the other roads approaching Cambridge. A friend of mine now takes 25 minutes coming from Cambourne to Cambridge rather than the hour it used to take in the mornings since the access road was opened. Kevin, I think you’ll find that most roads of any significance in Cambridge are pretty busy on Saturday afternoon. The fact that the access road is used enough to make a difference at rush hour during the week is good. The fact that it is not being used otherwise because the Cambridge ruling elite decided not to allow most drivers to use it is not good. Although Rupert’s question is welcome, I note the pejorative use of the phrase “rat run”. Is Long Road (for example) a “rat run” (the link road would divert traffic from that)? The whole implication of this phrase is that drivers are misbehaving by driving down a public road. Perhaps if the Cambridge transport planners started viewing drivers as customers rather than as problems we might end up with a better transport system. And we wouldn’t need spy cameras on this road (how are the Lib Dems about this? ), nor questions about what the exact rules are. that they have given to your questions. 1. Is the enforcement entirely automated? letter from the police. If warnings are subsequently ignored this could then lead to the issuing of a fixed penalty ticket by the police. without parking or going into site. 2. If it is not entirely automated will this take a lot of police time to enforce? In otherwords will this take time away from policing the hospital? The system is automated with staff from police headquarters giving administrative support for the issuing of warning letters and any prosecutions . support .However, if a Police Officer follows a vehicle through the restriction and they clearly have no business at the campus they can issue a Fixed Penalty Notice Ticket under NO81 code. With regards to normal calls for service made by Addenbrookes to the Police these will be graded and responded to accordingly. 3. Is there a “White List” and is such a list being created? ( I asked for clarification with regards to this and it is a list of people/cars allowed to use the road i:e person/ vehicles that will not be investigated). will be entered on the camera database to avoid any further enforcement action for as long as the need for access remains. The hospital will manage this process. 3a) Are emergency vehicles on the “White List”? The Traffic Regulation Order has an exemption within it for all emergency vehicles and therefore no enforcement action will take place for such vehicles. 4. How long is the data kept? The only data stored will be violation reports and these will be kept to enable criminal procedures to take place and any appeal if a conviction is obtained. It is likely these reports will be deleted after 24 months. 5. Who owns the cameras and who operates them? The camera system has been purchased by the developers of the MediPark site who also meet all the operating costs. 6. Will it be a private company issuing the “tickets” or is all the enforcement by the police? activity. It is believed that the Road Safety Bill will at some time in the future allow for the local authority to enforce moving traffic offences and take over this activity. I understand that the county council will shortly be providing an updated Frequently Asked Questions document on the access restriction on its website following the opening of the new access roads to the hospital. I hope that this may have answered your questions. If you require any further clarification may I suggest you contact Richard Preston at the county council (Richard.preston at cambridgeshire.gov.uk) . Cambridgeshire Constabulary monitors all internet e-mail activity and content. This communication is confidential and intended for the addressee(s) only. Please notify the sender if you have received this in error. Unauthorised use or disclosure of the contents may be unlawful. Opinions expressed in this document may not be official policy. * Warning letters will be issued by the police. * Fixed Penalty Notices will be issued by the police. * Data is not kept on those not violating the TRO. * The Developers of the MediPark site purchased the cameras. * The whitelist will be created from the list of those who have sent a warning letter, but who have given details of their need to access the hospital. The hospital is managing the whitelist. It is notable that while I’ve been told no enforcement action will be taken against emergency vehicles; I have not been told they are not on the whitelist. It appears the situation which I and many others have been lobbying to avoid, where emergency vehicle drivers will have to respond to warning letters explaining why they should not be pursued, has occurred. I hope there is still time to stop this. This response suggests that the only trigger for sending a warning letter will be the time taken to travel between the points; rather than as previously stated repeated use of the road within the permitted time. Cllr Moss-Eccardt’s written question, which he reports in comment 11, was answered at the Full Council on the 7th of December. The answer was provided to me when I attended the meeting however it has not been made available electronically. 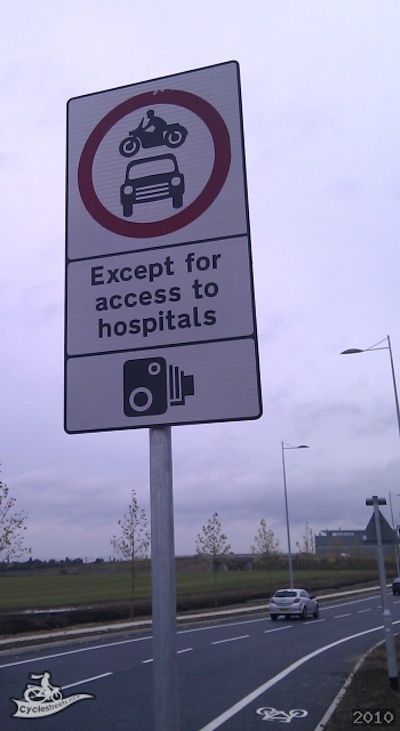 As with any other ‘access only’ traffic order the Addenbrooke’s site order is enforceable by the police through normal enforcement operations. However to supplement these operations, the developers of the MediPark development have funded the installation of an automatic number plate recognition (ANPR) camera system. The ANPR system records motor vehicle registration plates at all entry and exit points to the hospital site and these are then cross matched and the journey times through the site monitored to detect through motor vehicle movements. The camera system meets all current relevant Government design and operational protocols. If vehicles are found to be using the hospital roads as a through route, the number plate details are then provided to the police for enforcement purposes. Initial enforcement action will involve the issuing of warning letters to registered keepers of the vehicles. If recipients of warning letters consider they have a legitimate need to access the hospital site, the warning letter includes a form that drivers can complete and return to the hospital authorities explaining their need to access the site. Once verified by the hospital authorities, the vehicle registration plate details will be entered onto the camera system database to avoid further enforcement action. If drivers fail to respond to the warning letters, any further detection by the camera system could then result in prosecution action by the police by the issuing of a fixed penalty notice. While the council’s response makes no mention of any permissible time-delay and allowance for dropping off / picking up in the site it is otherwise largely consistent with the information above supplied by the police. That the road is on private land isn’t important – that the public are not obstructed in their entries makes it a public highway, therefore the sign must be of the correct type. They can erect any signs they like on a road that isn’t a public highway, but then the council can’t make a TRO for such a road. Anyone asked DfT if there’s an authorisation in place for this non-compliant sign? If not, then the police, council, NHS trust and operator are acting unlawfully. I’m getting a fair bit of traffic to this article form the Lotus Enthusiast’s club web forum (accessible to registered users only). A couple of their users are not happy with having received letters from Cambridgeshire Police threatening fines. One of them says they only used the road once. More interesting one user claims that certain ambulances are not permitted to use the road due to its adverse camber. I think anyone threatened with a fine should, if they have the finances to cope with the risk, go to court. I think that, given the decision to prosecute, is filtered in the first instance by the ‘hospital authotities’ I think the CPS would be hard pressed to show “due process”. My husband drops me off every morning..we recently had a letter asking if we had a valid reason. we explained that i was dropped off. A further letter arrived, saying that it wasn’t a valid reason. We are usuing one car to enter Cambridge, do not park in Addenbrookes car park. If dropping of isn’t a reason, what is? The question which needs to be asked of the above commenter is if they are being dropped off within the Addenbrookes campus. Dropping someone off within the campus would be permitted, going through to drop someone off elsewhere would not. Re: the above my husband drops me off just as you reach the guided bus route bridge.. I then walk along the path to the main campus. You could write back to the police or the hospital pointing to the traffic regulation order (links above); however if they’re misinterpreting it for you they could be for others. From whom did you get the letter? If it were the Addenbrookes’ people then I’m not sure what power they used to look up your address. If it were the police then I would ask them to explain their reasoning. Used my wife’s car to take someone to A&E at 10.30 p.m., stayed with them and left at 3.00 a.m. so obviously not taking a short cut! Went in via main entrance, left via new Addenbrookes Road. Got threatening letter. My wife works at the hospital on a 1 in 4 on-call rota! Complete waste of everyone’s time, stupid idea from the start, politicians and police getting involved where not needed. As usual, only people benefitting are lawyers and public sector managers/administrators. It seems clear that webcams are in use at “entry” and “exit” on the Addenbrookes road, to catch motorists who take less than 15 minutes between these two points. Where, exactly, are these cameras located ? Are they in operation now, in October 2012 ? They’re not “webcams”; they’re ANPR cameras; and they are still in operation. We have not enforced along this stretch of road during the timeframe mentioned due to issues with the Traffic Regulation Order (TRO) which limits the speed and usage of this stretch of road. Once these have been resolved we will begin enforcing again. The time frame in question was November 2014 to June 2015. The reports suggest a whitelist of site employees is being drawn up. I hope all ambulances are also added to the whitelist; it would be terrible if ambulance drivers were faced with the paperwork associated with contesting fines. Living in new build Bovis development on Addenbrooke’s Road. Thanks for your running commentary. Please keep us updated as you are clearly more knowledgeable at finding, accessing and researching the important information. This new order was signed on the 10th of November 2015 and came into force on the 20th of November 2015. As the council don’t publicise the orders it probably hasn’t been available online until the response to this FOI request. One change is the use of the road name “Dame Mary Archer Way” rather than “Southern Access/Perimeter Road”; there doesn’t appear to be any substantive change. I live in North East Herts and commute in to Cambridge working at one of the Colleges. I would like to enter Cambridge on Hills Road from Little Shelford, turn left in to Addenbrooks (to avoid the temporary lights at the junction with Long Rd) and follow the road around to the right entering Long road via Adrian Way. Is this legal or will this incur a fine or penalty? I would be very grateful for any response. That’s exactly the kind of trip the traffic regulation order is intended to outlaw.